This is the King GODZILLA 1991 BY HAZAWA-GUMI. 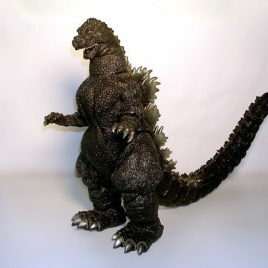 This is the Black vinyl unpainted version of King Goji. He is articulated at the arms, legs, tail and neck you can pose Godzilla as you wish. Make room on your shelves, Hazawa gumi figures will make a great addition to any collection. Comes MINT IN BAG WITH HEADER. It did not come with a collector card. 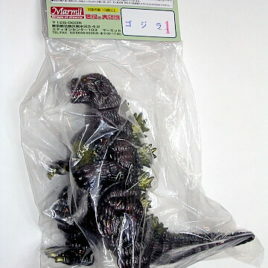 This is the hard vinyl Godzilla 1991 JUMBO Figure. Made by Bandai, this impressive, hard to find figure stands approx. 14 inches tall and measures a whopping 20 inches from Snarling Snout to tip of Spiny Tail! Articulated at the arms, neck, legs and tail, this is the OPEN Mouth Jumbo version of the 1991 Heisei Godzilla. The Figure is in MINT CONDITION AND COMES IN NEAR MINT BOX! This is the original 1991 Box which has the Godzilla vs King Ghidorah logos on the back and front of the box. 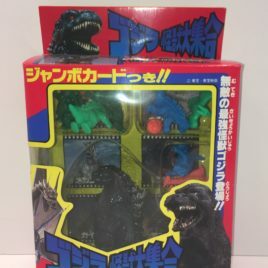 The figure was re-issued several years later and that box does not have the Godzilla vs King ghidora logo on it. A Great addition to any Collection. IMPRESSIVE!! 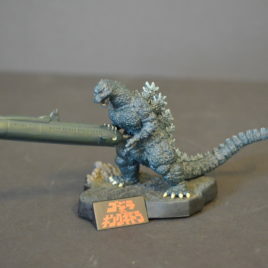 Check out the comparison photo that shows the Jumbo with the 8 inch Godzilla. ( this photo is only for comparison of size). Marmit has just released this gorgeous King-Gogi (Godzilla vs King Ghidorah) CLOSED MOUTH FIGURE! Godzilla 1991 stands approx. 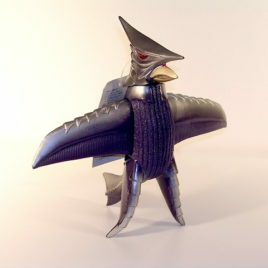 9 inches tall and is articulated at the neck, arms and legs. This hard vinyl figure is a RICH, RICH CHOCOLATE BROWN with bright GOLD CLAWS, FINS AND EYES! This is a CLOSED MOUTH 1991 GODZILLA! MARMIT HAS DONE IT AGAIN!! He looks VERY ANGRY! It comes Mint in Bag with colorful header. 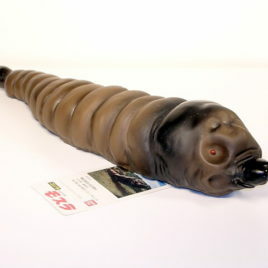 This is the hard vinyl 1961 style 1991 Bandai release of Mothra Larva. 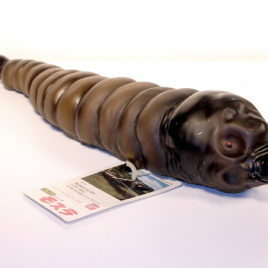 This is a LARGE figure that is 14 inches long! This represents Mothra in the original Toho 1961 Movie Mothra. It is in Excellent Condition with an attached MINT-Near Mint"perforated" type Tag. 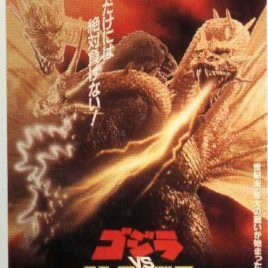 GODZILLA VS. KING GHIDORA 1991 PHOTO STYLE ONE SHEET JAPANESE THEATRICAL POSTER. Approx. 20 1/2 by 28 1/2 inches MINT CONDITION. Here is an unusual item: a Godzilla refrigerator magnet with the colorful artwork from the theatrical poster. 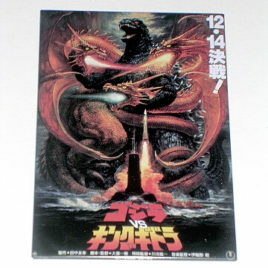 This one is Godzilla vs King Ghidorah 1991. Collect your favorites.The magnet measures 4 inches by 3 inches. " MOM GODZILLA'S ON THE FRIDGE! " Produced by Bandai in 2002 these are hard to find. Limited Quantities. This is from the early Yuji Sakai Directory Set Dioramas. Godzilla 1991 with Submarine (from Godzilla vs. King Ghidorah). A VERY DRAMATIC Diorama! The detail on these is AWESOME! Each diorama comes with its base and requires some snapping together. The diorama measures approximately 3 1/2 inches tall These dioramas are getting VERY hard to find! GODZILLA 1991 WITH SUBMARINE! Cast Company Japan has produced another fabulous diorama exclusive for an OSAKA Toy Event 2012. This diorama has the classic 1991 GODZILLA and the NUKE SUBMARINE. Each figure has its own separate stand to pose as underwater. These poli resin figures are beautifully detailed. 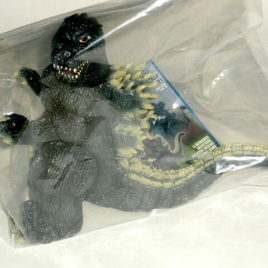 THE GODZILLA 1991 FIGURE COMES WITH AN "ON LAND" DIORAMA as well as the one for "UNDER THE SEA". The Submarine has incredible detail including tiny, tiny antene that can be insterted on the conning tower. It even has decals that denote the number of the Sub as well as another DISPLAY STAND! 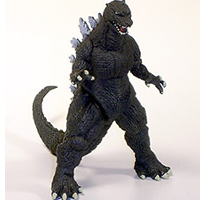 Godzilla 1991 stands approx 4 inches tall and is approx. 6 inches long. The sub is approx 4 inches long. This is a delux two part diorama that would look great in any collection! 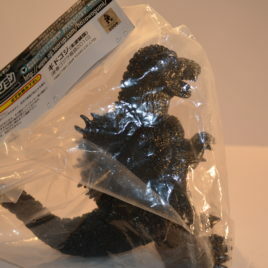 Cast produces these figures under a license as "ornaments" and the Godzilla figure comes with a plastic hang tab. COMES MINT IN ORIGINAL BOX WITH PAPERWORK. Please scroll down for additional photos. This is the hard vinyl 1961 style 1991 release of Mothra Larva. This is a large figure that is 14 inches long! It is in Excellent Condition with an Excellent-Very good attached "perforated" type tag. Please scroll down for additional photos.